First the good news: it seems clear that some manner of republican -- a republican social democrat, to be precise -- was elected and is now in office in Aras an Uachtarain. More importantly, it also appears that he intends to apply his beliefs and political philosophy , without fear or favour, insofar as his new position allows. However, that election came at a huge cost to republicanism and to Sinn Fein in particular. The decision to nominate Martin McGuinness, one of the most disliked politicians on this island, has set that party back by several years and thrown a question mark over its ability to advance into power in the 26 Counties. There is a problem within the Sinn Fein leadership. To understand that, we must consider the incredible turmoil facing the 26 County state at the moment, and the political upheaval which is underway. The conservative forces of this state have been exposed as a mafia, a circle of golden circles, which is about to go down for the third time. Sinn Fein’s continued inability to convert this historic opportunity is simply baffling to outsiders. We are also in a fin-de-siecle time of revolutionary change across the world, and the evidence is plain to see. The internet is feeding a sense of private and public empowerment, a cultural transformation that is encouraging an unprecedented exchange of ideas, radicalism and direct action for change, in Africa, the Middle East, Europe and the US. In Ireland, however, we remain caught in the death grip of a reactionary oligarchy. The republican potential for radical change in this island, so long identified with Sinn Fein, has become so weakened that despite a popular longing for a political alternative, there has been only a continuation of politics as usual. As the first meaningful test of voter sentiment in Ireland since the change of government earlier this year, when another improbable, greedy coalition took power from a deeply wounded Fianna Fail and their Green Party sidekicks, the Presidential election was always going to be a hugely significant event. To what extent would the people come out against politics as usual, and make a revolutionary leap forward? The timing was ideal for Sinn Fein, but the powers that be within the 26-County establishment had plenty of advance warning, so as to develop a counter-strategy. That may well have been its downfall. The choice of Martin McGuinness as candidate will surely be examined by future historians. There were other candidates available who would certainly have secured double the support he received, and could even have won the election. McGuinness’s candidacy allowed decades of old propaganda to be dusted off and compressed into a single focussed, anti-republican campaign. His denial of any IRA activity since 1974 only raised ridicule and further hostility. There was also plenty of ‘sneaking disregard’ for the peace process, which was wrongly believed, would win votes. It probably lost more than it gained. Rather than tackle the enormous issues facing the Republic, the Sinn Fein campaign was often confronted, not by the professed immorality or otherwise of the Provisional IRA, but by its failure to reach its objectives. Time and time again, McGuinness and his spokesmen were goaded about the Good Friday Agreement being “Sunningdale for slow learners” - that the Provisionals settled for less than what was on offer in 1973. It was all shrugged off as an “eye opener” by Martin McGuinness, but if he and his party genuinely believed he would be showered with garlands and petals for ‘bringing peace’ to Ireland, they have become totally divorced from a true understanding of Irish politics. The 26-County securocrats certainly saw it coming. Carefully timed media ambushes, shrouded in propaganda and the well-worn tactics of the establishment media, were clearly planned well in advance. A tiny number of unpopular IRA actions were laid repeatedly at Sinn Fein and McGuinness’s door. Decades of work to build republicanism as an alternative political voice in the south was lost in a cloud of recrimination, confusion and distraction. The opportunity to convey a pregressive message of real political change was buried amid constant denials and excuses. 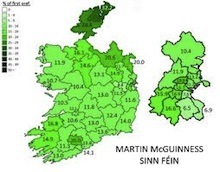 Many parts of the 26 Counties failed even to register a vote to match that which Sinn Fein received in the Spring general election. Instead voters veered wildly, and quite desperately, among the candidates before settling on Michael D Higgins, a man who thankfully has confirmed his long record of anti-imperialist, progressive, and at least arguably, republican views. Ironically, this contrasts sharply with the conflicted statements of a process politician who has now embarrassingly return to his real job - at the helm of British rule in the north of Ireland. Certainly, McGuinness and his advisors should take, and admit, much of the blame. Whether it was ego or self-delusion - or something else - which encouraged the belief that he would be lionised as a peacemaker, he accepted a nomination that any clear-minded politician would have quickly declined. But by all accounts, it was the imposed diktat of the Sinn Fein Officer Board, that tiniest of cabals, which was behind the decision. Just as there was no warning or debate beforehand, there has been no explanation or even an acknowledgement of its error. The concern here is not the machinations within one political party, or even the importance of the Presidency, but the once-in-a-lifetime opportunity to change Ireland for the better. Sinn Fein’s almost unique potential to be the vehicle for that change may now have been terminally compromised.